Curried pumpkin soup is something I like to make when I have an extra can of pumpkin in my pantry. If you have never had a pumpkin soup before it is a rich and creamy dish that is hard duplicate. 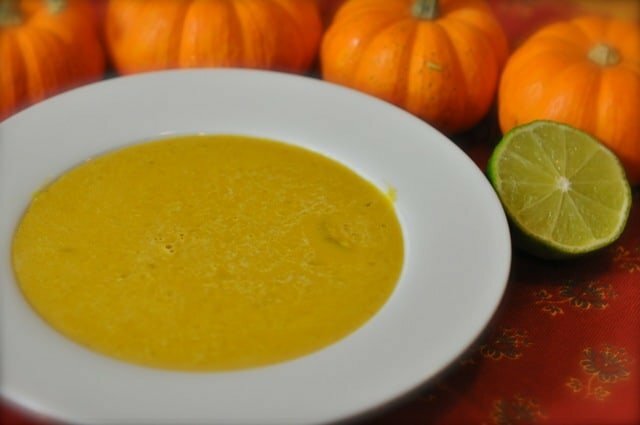 This recipe adds a nice bit of spice with the curry, so if you have never tried pumpkin soup, this may be a great time to try this soup. Soup is a simple meal to make and you can make your own additions to this recipe. This particular soup is thick, rich, and hearty, with just the right amount of spice. I am using a can of pumpkin for this recipe. So often after the holidays I have an odd can of pumpkin that I want to use up. Or I have been known to stock up on a can or two when they are on sale at my local grocery store during the holidays. You could bake your pumpkin first. First off, it is naturally gluten free, so if you aren’t a fan of gluten, this is a good recipe for you. If you want to make this dish vegetarian, swap my chicken broth for vegetable stock. Best of all this soup literally takes less than 20 minutes to make. This version has an Indian inspiration. Curry and pumpkin blend so well together in this easy to make recipe. This dish makes up two small servings or one very large bowl of soup, so this is the perfect soup to make when you are dining by yourself. You may want to top this soup with a little yogurt if you have it on hand. This homemade curried pumpkin soup is made from scratch and has just the right amount of heat. Saute onions and curry powder in butter over medium heat in a pot until the onions become translucent. Add in 1 can of pumpkin puree. Stir until there is a uniform mixture. Add chicken broth and heat until the soup just begins to bubble from the heat. Add in heavy cream and stir well. Just before serving squeeze the juice of one lime into the bowl. I have fresh (well, it’s not fresh anymore… it’s frozen in ziplock baggies) pumpkin. Can I use it for this recipe and if so, do I use what, 14.5 ounces? Sure, or you could use about a pound of the pumpkin. I think that should work. So I’m guessing that’s about 1.5 cups. I happen to have an extra can of pumpkin in the pantry and this will be on my table soon. Thanks Stephanie for the recipe. Pinned. i hope you enjoyed the soup!